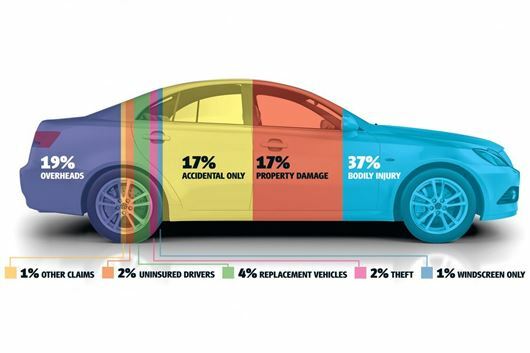 Personal Injury claims account for 37% of car insurance claim payouts and much of that is fake whiplash claims. Now, at last, the Ministry of Justice has announced plans to curb this fraud that puts up everyone's car insurance premiums. British car insurance premiums have risen by more than £80 over the past 12 months. AA Insurance reckons that at least half of that £80 is accounted for by fraudulent whiplash injury claims. Michael Lloyd, director of AA Insurance comments: “That there over 800,000 small injury claims registered through the Ministry of Justice small claims track last year, of which 750,000 are estimated to be whiplash injury claims is, frankly, shocking. It’s little wonder that the UK is shamefully regarded as the whiplash capital of the world. “We would particularly welcome capping of compensation for minor injury to £425, paid only on medical proof of injury; banning offers to settle without medical evidence and a more transparent tariff of compensation for more serious injury. Last year, the AA conducted a Populus poll of over 20,000 AA members showing that 63% of drivers had been cold-called by firms trying to persuade them to make an injury claim even if they had not been injured. The same research showed that a significant minority of drivers (11%) said they saw nothing wrong with making a claim for injury compensation, even if no injury was suffered. That implies that 11% of British drivers are potential criminal fraudsters perfectly prepared to steal cash from every other insured driver. This needs to be stopped.